We live in a throwaway society whose resources are dwindling. SHOEPASSION.com defies detrimental consumer trends by guaranteeing sustainable production and products made in the EU. We have dedicated ourselves to accumulating and disseminating expertise on Goodyear-welted shoes and their advantages, as well as to offering our own collection at affordable prices. Move away from shoes that cause you pain and towards shoes you can feel passionate about. S ay goodbye to poor-quality shoes! At SHOEPASSION.com, we are commit­ted to illuminating the advantages of Good­year-welted footwear, as well as to offer­ing our own collection at attractive prices, using an effective chain of distri­bution. We focus upon expert know­ledge, quality, extra­ordinary service, and full transparency. What do we do at SHOEPASSION.com, and what makes us special? Get to know the values and norms that we do business by. Take a look inside our factories in Spain and Italy. These texts, images, and videos show teach you all about the meticulous production process that goes into our shoes. A single customer testimonial is worth more than a thousand words of advertising copy. Read excerpts from SHOEPASSION.com customers’ feedback on their purchases. Are you satisfied with our products, or do you see room for improvement? Leave us a review, too. The stuff that dreamy shoes are made of. Thanks to poor-quality tanning practices in the Far East, leather frequently gets a bad rap in the press. We focus on gently-processed leather sourced from Europe. Learn everything about our leather here. Our customer service is every bit as worthy as our premium products. We promise secure purchasing and a quick and insured delivery, and we are always ready to address your questions and concerns. O ur philosophy is not to sell mass quantities of cheaply glued-together footwear. 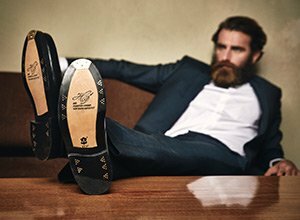 Instead, we are a pre­mium purveyor of select goods — we offer full-leather shoes, sophisticated shoe care products, and accessories. We have also amas­sed a solid base of shoe expertise, mani­fested in our comprehensive shoe encyclopaedia. We believe that our premium products deserve to be sent in worthy packaging. Learn more about the contents of your delivery here. These professionals deal with shoes, shoe care products, proper shoe care, and shoe styling on a daily basis. We asked these experts to provide their opinions on our products, and received surprisingly honest answers. We started out with just a small handful of employees, and have grown into a large, multinational family, united by our love of shoes. Take a look behind the scenes and get to know the people for whom shoes are much more than simple commodities. Some offices leave every man for himself; 9 to 5, day in, day out. Not us. We are passionate about our building and supporting our team. Learn from the best, and realise your potential in a friendly environment.